Even the most dedicated rockers have heard of Slim Dusty and his international hit 'The Pub With No Beer'. Fewer would realise that the song became the first ever Australian gold record and that since then he has earned no less than 38 more and is well on his way to his third platinum award. Sure, his sound reminds you of hillbilly country music, but Slim Dusty is the leading exponent of the traditional style Australian bush ballad, a style that is the strongest musical part of this country's heritage. The songs are ballads relating to the country. The country men and their way of life. Slim co-wrote five of the songs and arranged one traditional track. The clean precise production of Rod Coe suits the music. If you want to find out why Slim Dusty outsells your favourite rocker in Australia, give this album a serious listen. 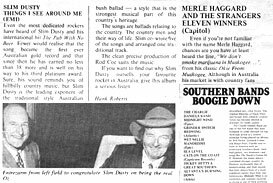 Even if you're not familiar with the name Merle Haggard, chances are you have at least heard the line "We don't smoke marijuana in Muskogee..." from his classic Okie From Muskogee. Although in Australia his market is with country fans (who speak his name with reverence), in America his appeal is much wider and many of his records cross into the pop charts. The importance of his music is undeniable, he is a master of capturing everyday emotions of everyday people, and his name will go down in history alongside Hank Williams and Woody Guthrie. He was also a strong influence on the original pioneers of country?rock, and many U.S. rock stars. Now that that's said, let us turn to the record in hand. Since he has recorded in the region of forty albums, there have already been several compilations of his work. Eleven Winners represents the best of his more recent recordings for Capitol; he has now, after many years with them, moved to MCA. This compilation includes two of his best ballads, It's All In The Movies and If We Make It Through December, and his version of the beautifully sad Tommy Collins song, Carolyn. Amongst the uptempo numbers is the theme song Haggard wrote and performed for the T.V. series Movin' On, a great truck-drivin' song featuring the much copied talents of guitarist Roy Nichols front Haggard's long-serving backing band, The Strangers. Haggard has worked his way through all the variations of country music; truck-drivin', beer-drinkin', gun-fightin', prisons, western swing, even Dixieland! If you need an introduction to Merle you could do a lot worse than starting here. There have been few albums produced in this country of a world-class standard that still remain distinctly Australian. Mostly they have achieved acceptability by assuming a faceless identity that is all too often bereft of character. Road To Town is a collection of songs by John Williamson that are obviously Australian, capturing images of the bush and particularly the merging of city and country life, presented in an intelligent manner without resorting to the old clichés of 'roos and billabongs. Although he is best known for his 1970 novelty hit Old Man Emu, Williamson appears here as a mature singer songwriter, and only one track is reminiscent of that song, the whimsical Murrumbidgee Madness (you have to buy the album to discover the cause of that brand of insanity). The rest range from love songs to travelling songs, and there are many exceptional tracks including an up tempo number, Gotta Get Back, which features, multitracked harmony slide guitar by Tommy Emmanuel. Amongst the ballads is a beautiful song, I Still Cry. The complicated, and somewhat messy demise of The Allman Brothers Band marked the end. of an era for the many southern boogie bands and their imitators who had risen to prominence on the crest of the commercial wave that, for a while, rejuvenated a flagging U.S. rock scene. Of those that remain few retain their original vision, and have either lapsed into self?parody or diversified into other forms. The original blending of black blues and boogie with redneck country values, has become diluted in attempts for wider appeal. The Charlie Daniels Band are one of the few bands that have managed to come through on top. Although noted as a session musician having played on albums by Bob Dylan, Leonard Cohen and Ringo Starr, Charlie rose to fame in America with an archetypal Southern Band - twin lead guitars, two drummers and songs like The South's Gonna Do It. However the music always contained stronger country influences, particularly that of western swing, and their recordings have always been of a more consistent nature than their contemporaries. Midnight Wind is no exception and contains material as strong as any of their previous recordings. The album was recorded at Capricorn Sound Studio, Macon, Georgia, and produced by Paul Hornsby, as was Redwing the new elpee from Grinder Switch. They are relatively new to the bright lights and have been touring as openers for The Charlie Daniels Band. From the twin guitar intro of the first cut there are no real surprises on this album. Although most of the material is new, it will sound accessible to anyone familiar with the music of Southern bands. To their credit the songs are performed with energy and precision, which gives it an appealing sound, albeit unmemorable. Originally from the Capricorn stable, after seven years and as many albums, Wet Willie have taken drastic measures to move into new directions. Three new members have joined the band and they have made the move of recording in England, at the studios owned by Virgin Records, The Manor. Manorisms shows quite clearly that they have been strongly influenced by the music that was floating, around the English airwaves last year. Although far from being carbon copies of anyone, several tracks display the influence of Queen (mostly in the vocals of the ballads), R&B in the style of Graham Parker (possibly hearing him rekindle original and obvious mutual influences). You may have heard the single, Street Corner Serenade. with its infectious pseudo-reggae beat. It's lightweight but clever, and an example of the possible risk that they may well alienate their entire following. Sea Level was never a boogie band, but they were born from the remnants of The Allman Brothers Band. Pianist Chuck Leavell, bassist Lamar Williams and percussionist Jai Johanny Johanson regrouped to form this jazz orientated outfit, Instrumentally they sound much like any jazz/rock band, but in the Vocal department you can still hear traces of their heritage. This album was also recorded at Capricorn Sound Studios. Could be that whatever sound you bounce against their studio walls, a part of the Allman's tradition will bounce back with it. In the latter years of the Allman Brothers Band their sound became increasingly characterised by the lazy-voiced singing and distinctive guitar style of Richard Betts. He provided them with one of their biggest commercial successes with his song Ramblin' Man, and he also wrote the classic instrumental, Jessica. He had already recorded a solo album, Highway Call, before the band disintegrated and had built a strong reputation as a guitarist. Last year he released the debut album of his current outfit under the name of Dickey Betts & Great Southern. Their latest release is a strong collection that will appeal to Allman Brothers' fans as it displays how much of the band's sound was due to Betts. The first track Good Time Feeling sums up the overall mood of the set, and other highlights are the title track. Atlanta's Burning Down, an emotional ballad, and Mr. Blues Man which features Betts in a vocal duet with 'special guest' Bonnie Bramlett. It would be premature to sound the death knell of Southern boogie. The best of the bands still have large drawing power in America, but their appeal seems to be retreating to the localised areas from whence they came, and fewer bands seem capable of breaking out of the mould into a wider-appeal market. And this current crop of albums amply demonstrates why.